The Alhambra which is located in Granada, Spain is one of the Runners-Up for the New Wonders of the World and a World Heritage Site. 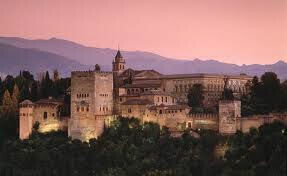 The Alhambra (Arabic for “red fortress”) contains a castle, a palace and a residential annex for subordinates, resembling medieval Christian strongholds. In 711 AD Arabic Muslims (known as Moors) crossed the Straits of Gibraltar and entered Spain, conquering it almost entirely. In 718, the Moors crossed the Pyrenees Mountains, reaching central France but were eventually defeated by the Franks at Tours in 732. The Moors who ruled Spain for almost 800 years were isolated from the rest of Islam which profoundly influenced their building styles. 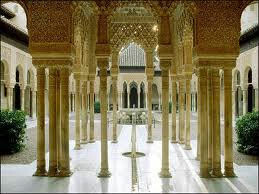 The Alhambra was completed towards the end of Muslim rule of Spain during the reigns of Yusuf I and Muhammed V, Sultans of Granada in the 14th century. 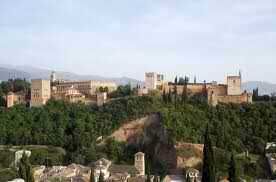 Artists and intellectuals took refuge in and helped build Granada as the Reconquista (Reconquering of Spain) until it was conquered by Spanish Christians under King Ferdinand II of Aragon and Queen Isabella I of Castile (as in Columbus discovering America) who took control of Granada in 1492. 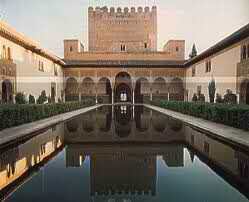 After the conquest of the city, the Spanish began to modify theAlhambra. The open work was filled up with whitewash, the painting and gilding effaced, and the furniture soiled, torn, or removed. Later, Charles V (1516–1556) rebuilt portions in the Renaissance style of the period and destroyed the greater part of one palace to make room for a Renaissance-style structure which was never completed. Philip V (1700–1746) introduced the Italianized the rooms and completed his palace in the middle of what had been the Moorish building. Over the centuries the Moorish art was further damaged, and the towers were destroyed by the French under Count Sebastiani. In 1821, an earthquake caused further damage. Restoration work was undertaken in 1828 by the architect José Contreras.